LONG POND, Pa. – Chris Buescher sat in his car on pit road, dreaming of the possibilities. NASCAR had just red-flagged Monday’s rain-delayed Pennsylvania 400 when a heavy fog settled over Pocono Raceway after 138 of a scheduled 160 laps, and Buescher was the unlikely race leader. “I’m thinking of every kind of rain dance I can,” Buescher said on his radio. The mental rain dance worked. 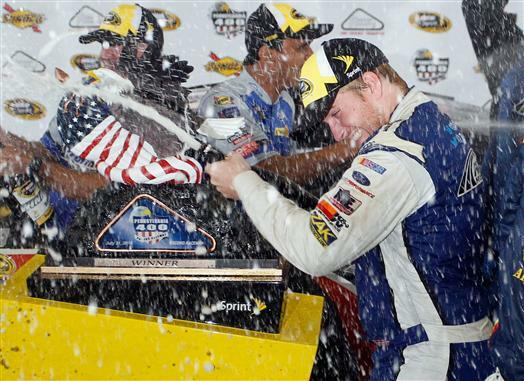 When NASCAR ended the stoppage by calling the race because of weather, Buescher had his first victory as a NASCAR Sprint Cup Series driver, and Front Row Motorsports had its first win since David Ragan took the checkered flag at Talladega Superspeedway 118 races ago. Buescher took the top spot by staying out on the track, outlasting faster cars that had pitted behind him. Brad Keselowski finished second, followed by Regan Smith, whose team made the same strategic call that propelled Buescher to the unlikely victory. Kevin Harvick ran fourth, followed by Stewart-Haas Racing teammate Tony Stewart. Even though the early call of the race deprived Stewart of a chance to win, he wished the best for Buescher during the red-flag period. For Buescher, the long, tense wait for NASCAR to call the event was well worth it. “It was stressful,” said Buescher, who lost a lap because of a pit road speeding penalty on Lap 94 and regained it as the highest-scored lapped car under caution on Lap 109. “I tried not to get my hopes up because I know how these things can play out. Mother Nature can be really nice sometimes and really mean. With rain in the area, Kyle Larson and Austin Dillon were among six drivers who stayed on the track under caution on Lap 67, and when the race went green on Lap 73, Larson streaked into the lead with Dillon in pursuit. With a strong run off Turn 3, Dillon inched ahead at the start/finish line on Lap 78, but Larson regained the top spot into Turn 1. Three laps later, Dillon moved to the inside of Larson in Turn 3, and their Chevrolets collided side-to-side. Logano, who had given the two frontrunners a wide berth, slipped to the inside and into the lead, passing both cars as they slid wide through the corner. When NASCAR called the fourth caution of the day on Lap 85, Logano stayed out under the yellow and brought the field to green on Lap 92. Logano held the top spot until pole winner Martin Truex Jr. pounded the outside wall for the third time on Lap 100 to bring out the fifth caution. At that point, the field inverted, with Logano and Kevin Harvick pitting from the first and second positions, respectively. That handed the lead back to Larson, who had pitted under yellow on Lap 86, along with Brad Keselowski, Kyle Busch and Dillon. On Lap 106, Logano’s winning chances evaporated when Chase Eliott’s Chevrolet broke loose in the Tunnel Turn (turn 2) and knocked Logano’s No. 22 Ford into the outside wall. Elliott’s car also took extensive damage when it nosed into the inside wall. But Buescher inherited the lead during a cycle of green-flag pit stops that started on Lap 124 and was running up front when NASCAR called the seventh caution on Lap 133 because of lack of visibility. Buescher can earn a spot in the Chase for the NASCAR Sprint Cup if he finishes the 26-race regular season in 30th place or higher in the series standings. Buescher currently is six points behind 30th-place Ragan, who now drives for BK Racing. Buescher is the first Sunoco Rookie of the Year candidate to win a Sprint Cup race since Logano accomplished the feat in 2009. Coincidentally, Logano’s victory came in a rain-shortened race at New Hampshire.